My journey to rice whiskey treats started with a request for bacon desserts, actually. I tried making the classic Rice Krispie Treat recipe with chopped bacon stirred in (and bacon fat in place of the butter), and while they weren’t BAD, they weren’t great, either. They had two distinct flavors, bacon and marshmallow sweetness, at the same time but not at all married together. My boss suggested a hint of liquid smoke, which I worried would overwhelm the other flavors, and someone else suggested a bit of bourbon. Bourbon! Now we were on to something. They were a HUGE hit. No one even cared about the bacon any more… They just wanted more rice whiskey treats. As soon as possible. The original recipe had one minor drawback, which was a change in consistency due to the extra liquid from the whiskey. They tended to be a bit too sticky and soft, so they fell apart at room temperature. Don’t get me wrong- it did not take long for these to go from plate to mouth, so no one was complaining, but I still wanted something that would hold together better. Reduce the butter called for in the original recipe. In a saucepan over medium heat, melt the butter. Add the marshmallows, stirring constantly, and heat until melted and just starting to bubble. Remove pan from heat. Add rice cereal and stir/fold until evenly coated. Chill in the fridge until firm before cutting. If your knife get sticky while cutting, try swiping each side of the knife with a stick of butter before cuts. 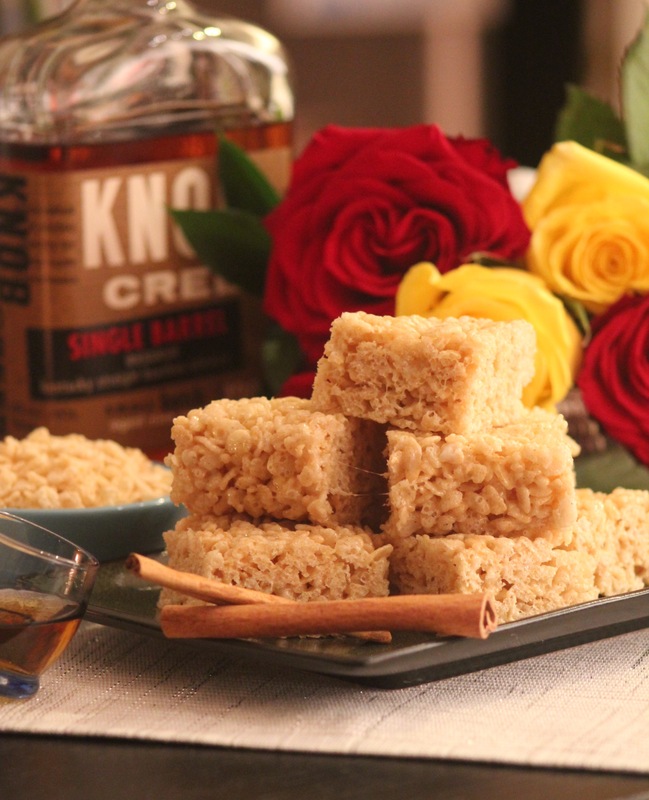 Rum/Toffee: For crunchy rum treats, replace the whiskey with an aged rum, leave out the cinnamon, and sprinkle 1/4 cup Heath bar pieces (or other butter toffee bits) into the mix when you add the cereal. Mocha treats: Replace the whiskey with coffee liqueur, replace the cinnamon with instant espresso powder, and mix in 1/3 cup mini chocolate chips when you add the cereal.